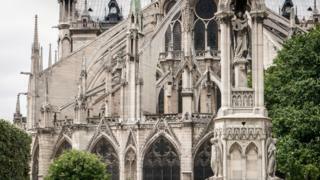 Paris's beloved Notre-Dame cathedral has been one of the French capital's most famous landmarks since it was built 850 years ago. Notre-Dame, which translates in English as "Our Lady", has played a role in key moments of history and captured the imagination of people around the world, drawing an estimated 13 million visitors a year. A plaque outside Notre-Dame marks "Point Zero" - the official centre of the capital and the marker in France from which all distances to Paris are measured. A major symbol of the Catholic faith, the cathedral contains revered relics, including the crown of thorns said to have been worn by Jesus before the Crucifixion. On Monday, the main spire and roof of the building collapsed in a huge fire. People across the globe are now mourning the damage. Construction of the Notre-Dame in Paris's Île de la Cité began under the reign of Louis VII in 1163. The first stone of the gothic building was laid in the presence of Pope Alexander III. But construction wasn't completed until 1345. Since its completion, the building has been the scene of numerous historic events. In 1431, England's Henry VI was crowned king of France inside the cathedral. It was also the scene of Napoleon Bonaparte's coronation as emperor in 1804. Joan of Arc was beatified in the cathedral and world leaders attended memorial services for former French presidents Charles de Gaulle and François Mitterrand there. Has it suffered previous damage? The building was damaged during the French Revolution in the 1790s, when mobs and revolutionaries looted the interior and declared the building a "Temple of Reason". During this time, statues of biblical figures there were beheaded. Historian Robert Tombs told the BBC that during the Paris Commune revolution in 1871 some "radical anti-clericals" tried to set the building on fire but were stopped by local people. "As there would have been no effective firefighting had the building caught fire, we might expect it to have been damaged even worse than now," he said. The cathedral also survived the two world wars largely unscathed and famously rang its tenor bell to mark the end of Nazi occupation in 1944. Victor Hugo's 1831 novel The Hunchback of Notre-Dame cemented the cathedral's place in popular culture. The book, which has since been turned into a Disney film, highlighted the poor condition the cathedral was in. This helped to prompt major restoration works in the mid-19th Century. Mr Tombs said the novel "made the cathedral itself a character, and made it internationally famous". Notre-Dame's school of composers has played a notable role in the birth of modern Western music. During the 12th and 13th centuries, they are credited with leading the development of polyphonic, or multi-part, compositions.